You would expect BMW’s PR representatives to say that, albeit, as press releases go, I’ve ploughed through worse. Two phrases do rather jump out however, both of which go to the essence of nu-Dreier‘s sharp new look. The first speaks about how the ‘3’ is pumping the volume up. How far do BMW’s amplifiers go, one is induced to ponder? On this matter, the press release remains coy. The second reference is to the Three’s ‘precisely drawn lines’. I did have to check that I wasn’t hallucinating but indeed yes, they have stated this quite unashamedly. Because to these eyes, the ‘strikingly contoured surfaces’ of the 3-er are characterised by lines, yes, but ones that appear to have been applied wholly at random by someone with no visual or aesthetic sensibilities whatsoever. But tempting as it might appear, I have not brought you here to hurl vegetable matter at Adrian van Hoydoonk, because if it’s a definitive visual dissertation of the BMW you seek, there’s only one place to click. After all the buck probably didn’t stop with him. No, if we wish to fling over-ripe foodstuffs, we really ought to take aim at Harald Kruger, BMW’s CEO and his horribly misguided board, who signed-off on this. But there is more to the new 3-Series than how it looks, especially given that over its forty-odd year career, it has never exactly been a stylistic pathfinder – (albeit some were better looking than others). Having said that, and entirely for the purposes of clarification, the new G20 iteration unquestionably embodies a new low. But the 3-er lives or dies on its perceived dynamic capabilities, given its position as the sine qua non of compact sport saloons – an accolade which has largely been built upon a number of lower-volume performance models and of course, BMW’s sheer consistency of mission. However, of late, there have been ‘pretenders’ – notably Alfa Romeo, who it could be said to have had a prior claim, and Jaguar, who hasn’t. Either way, both Giulia and XE have benefited from a quantum of positive column inches regarding the sharpness of their dynamic envelopes and the Bavarians are not happy about it. In fact they’re mad as hell, and not going to take it any more. It’s rather telling, to say nothing of unseemly, that a senior BMW engineer sees fit to issue forth in such terms and by association, bash, not simply a previous-generation product, but his former colleagues who worked upon what is widely regarded to this day as the pick of the 3-Series generations. E46, in just about any form, remains perhaps the template for what the model line ought to aspire to in form and execution, so to publicly dismiss it, really does speak volumes. But having set the record straight, Mr. engineer Frohlich elaborates as to why the new Dreier is superior, not only to its forebear, but to its putative rivals, telling Motoring, “First thing and this is for me the most important thing; you can drive fast and completely relaxed. You don’t feel how fast you are.” Now this statement bothers me. After all, haven’t we had enough of cars that require licence shredding speeds to enjoy? Fröhlich continues. “From the comfort it is more like a 5-Series, because this cluster architecture is so, so stiff; for example 50 per cent stiffness increase between front axle and bulkhead, 30 per cent overall stiffness. You do not only feel it in driving, you feel it in ride comfort.” Or to put it another way perhaps, it takes the signature stiffness characteristics of a BMW and turns the volume up several notches. Just how stiff does a bodyshell need to be, anyway? 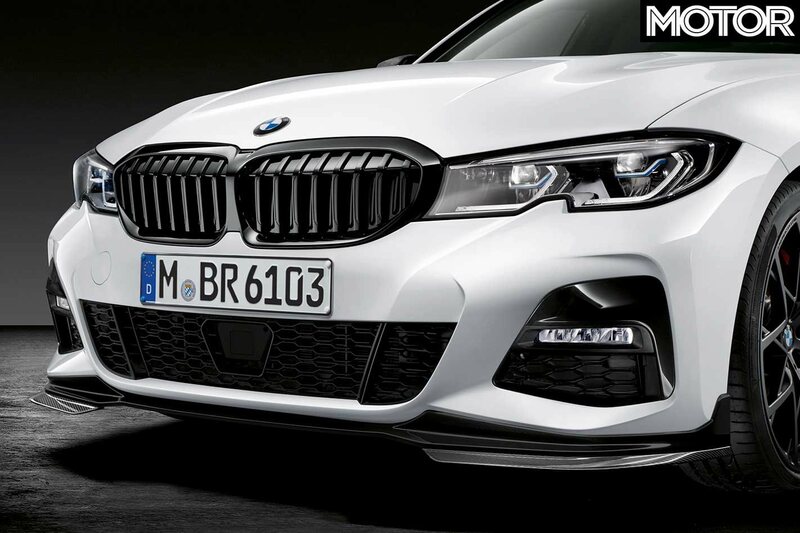 Spooling through the Motoring article, I also note that BMW are allegedly introducing a new damping system, which will be standard fitment across the 3-Series range. Which may perhaps have more to do with the Three’s improved ride comfort over its predecessor than its ultra-stiff bodyshell. “But from the heart of the brand [the 3 Series] is still the most important car”, Fröhlich concludes, and in this he is probably correct. It is. Which underlines why it matters that it’s such a visual crime scene. Why it matters that its performance envelope sounds like it can only be accessed at the upper end of the performance spectrum. That it has departed so far from its core mission as to be virtually unrecognisable. Put bluntly, I have come to expect a degree of ‘pseud’s corner’ toss from design spokespeople, but I somewhat naively expected more sense from engineers. Dr. Wolfgang Reitzle was in charge of research and development when the E46 3-Series was developed. You wouldn’t have found him spouting nonsense like this. Nor, for that matter, would you have caught BMW coming out with product like this, were he still in place. The state of affairs at Munich’s Forschungs und Innovationszentrum is worse than we could have feared. Expertly put, Eoin, nice one. When one of the main men can only use bad language it is indeed a sad sign. Aggression, weaponisation and Bavarian brute ignorance does not do it for me. How uplifting that Jaguar and Alfa Romeo have been receiving plaudits; the few Giulia’s seen make my head turn for the better whereas the XE to me is a little bland. and probably fewer seen. How wonderful it would be for the Italians and British to lead the way but we all know, sadly that the next car efficiently aggressively away from the lights will have a boxers nose. If you can’t articulate ideas clearly you aren’t thinking clearly. They mention precisely drawn lines. The drawing was on paper or a screen. Precise relative to what? I think they mean something else or, most probably nothing. That and the inadequacy of the final form indicates a fog exists in the minds of the design management at BMW. The ‘hey guys…’ question is exactly the one BMW is asking since they let Chris Bangle loose on their cars. Most depressing of all, it’ll sell by the bucket-load. With all due to respect to the Cortina and Ascona, the 3 is today’s Ascona/Taunus but pretends to be a cut above. Maybe that’ll become clear now the design is so plainly mediocre. 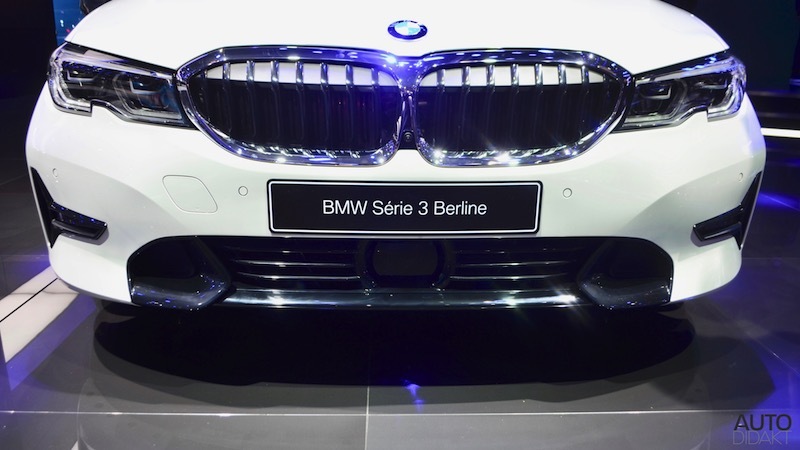 One more observation about the dismal G20 (I cannot bring myself to refer to it as a 3-Series anymore): The bidy coloured section of the bonnet visible through the grille on the white car HAS to be an oversight, no? Presumably, this will be obscured with black paint or sticky plastic on production models. However, the very fact that it passed unnoticed by BMW design staff tells you a great deal about the care and attention to detail lavished on this model. I’ve just taken a closer look at Eóin’s picture of the blue car above, and the bonnet section is blacked out, as one might expect. I’m surprised no-one’s yet mentioned the notches where the top of the front bumper juts into the lower headlight – a detail stolen from Peugeot. You know, there are a lot of great videos available on YouTube for the car design enthusiast. I was watching a couple earlier about the Mercedes W123 and W124. How I miss rationalism and sobriety in car design! There is no white section of bonnet visible through the grille. That’s just reflections from the flashlight. Yes, there is no white section. No, I didn’t use a flashlight, BMW chose to present the car this way. The angle of the black plastic strip at the upper end of the grille makes it a strikingly prominent feature of the 3’s front aspect, which is odd, as one would think the eye should be drawn towards more ‘worthy’ materials like chrome or metal. BMW design is very difficult to understand these days. It reminds me of Ronnie Corbett’s glasses…. The point of transition from vertical front to horizontal bonnet is where a pedestrian’s body would hit the car after being kicked off his feet by the low edge of the bumper. Here the upper body will be flipped from upright walking posture to horizontal before the head hits the bonnet. Therefore you need a large contact area to keep forces down. Isolated bars on the grille would be a far too large risk of injury so there’s a strip of plastic to provide a larger contact area. You want to have this ‘swivelling point’ as far up as possible to hit the pedestrian at his massive thighs and not at his fragile knees and the higher you set this point the further forward the head hits the bonnet, reducing the risk of hitting hard objects in the windscreen/wiper/A-post region. The comically exaggerated chrome grille surround (looks like it underwent silicone lip augmentation) simply provides one more centimetre or two here without making the front look completely ridiculous. I saw an article recently that said that the average leasing term for new cars in the UK is now 2 years, and I suspect that shorter leasing times contribute to ‘shouty’ design and over-specified vehicles. If people change their vehicles regularly, brands’ emphasis will be on catching customers’ eyes, not on long term appreciation and satisfaction. Not an excuse, but perhaps an explanation of the way things have turned out. Is it the case that “shoutier” cars appeal to the second keeper of the vehicle? Leasing must have affected colour choices. I know zero about leases – they seem a nasty way to keep a car – so excuse my question: does the leasing firm pick the car´s spec and then offer it to customers? Or does the customer spec the car themselves? Lease rates are all about residual values. The higher the price the lease company can ask for the used car the lower the fee to the customer. In case of a user-chooser model the latter gets a fixed maximum lease rate and can spec his car as he wants. Here you hit the weird situation that cars with lots of electronic nonsense come at a lower lease rate than more sparsely equipped cars because manufacturers artificially subsidise asisstance systems to push them into the market. In these contracts silver cars come at lower rates than white vehicles because they’re easier to sell on. In typical field service applications the customers leases several hundred of identical cars with a set specification that are easier to interchange when employees leave the company. In Germany where more than eighty percent of Audis, BMWs or Benzes go into corporate lease schemes the typical calculation is for a three year lease contract at 80,000 kilometres overall and then a second round of use of three or four years. Then the car is to be thrown away according to the manufacturers. With the aid of modern computer optimisation manufactuers are able to design cars to these specifications with frightening accuracy, making it a true game of hazard to buy an old car designed for this kind of use – I wouldn’t touch an eight or ten year old Audi or Benz with a barge pole. Dave: that´s terrifying. I met an engineer who explained how parts could be designed to fail after quite precise periods of use. That´s different from ensuring they reach a set service life. Planned obsoloscence always revolted me. The loser (among the many) is the maker of cars that die like the Replicants in Blade Runner. That eight-nine year life eventually feeds back into the first price customers are willing to pay. When Mercedes still was Mercedes all elements of their cars were designed to last at least 400,000 kms – one of the reasons they never reached any synergy effects with Chrysler. As this was a minimum requirement you often found old Benzes with mileages far beyond any reasonable expectation. I remember quite well a local taxi, W124 200D where the odometer had failed at 978,000 kms and which was going strong, if a bit clonky for an impressive number of years. Today most cars are designed to fail at 230,000 kms and computer assistance makes sure they do. My last car, an A4 B6 lasted fifteen years and more than 500,000 kms and I sold it because a necessary repair would have been economically mad. My current B8 will definitely be sold before its five-year factory warranty expires and I wouldn’t bet on it lasting more than eight or nine years and surely no more than 250,000 kms. Thanks for the pointer to YouTube, John. I really need a break from this depressing stuff and the W124 should do nicely! As Kris says, it’s odd that the plastic parts of the grille are given such prominence. Maybe the plastic part has aerodynamical properties ? Peronnally I don’t really have a problem with it, I think I can see what BMW meant to a certain extent when designing the grille: the effect would’ve been completely different if the kidneys were stripped of that plastic bit, not necessarily uglier but clearly this is how they preferred the grille to look. And why not. I think it slims the grille down visually and the angled, filled black upper part of the grille gives it a more solid look. At least it’s not as obvious and ill-fitting as those camera-related black plastic rectangles found behind many grilles today. Here, the bottom outline of that plastic bit follows the line formed by the upper part of the headlight, it’s not that random or misplaced in my opinion. Someone commented that BMW “stole” the stepped headlight idea from Peugeot. I really don’t think BMW knowingly stole the idea: It’s very subtle but Peugeot is often ahead of styling trends, they just got there before BMW this time, I wouldn’t be surprised if a similar headlight treatment found its way across the industry soon. Not to belittle Peugeot but I don’t think BMW would look across the Rhin for styling inspiration, they might be stuck in a rut style-wise but they usually do their own German thing, the similarty with Peugeot’s headlights is probably down to a trend not outright theft. We can also note in this 3er the particular way to design the lines around the bumper and wheel arches first found on the Peugeot 207 and that are now slowly making their way to other cars, they make the bumper corners angled and a lot less rounded. I wonder what BMW’s new design direction entails. To me, the new 3 looks much like any other recent BMW, but I worry that the intended destination is that hideous i Vision thing that was previewed recently. As for the dynamics – as I understand, a car’s structure simply cannot be stiff enough (obviously, there is a practical trade off with weight) and the new approach to the suspension is belated recognition that absolutely no one ordered the optional adaptive dampers, so designing the car around them is dumb.